Every Thursday, Bespoke publishes its “Bespoke 50” list of top growth stocks in the Russell 3,000. Our “Bespoke 50” portfolio is made up of the 50 stocks that fit a proprietary growth screen that we created a number of years ago. 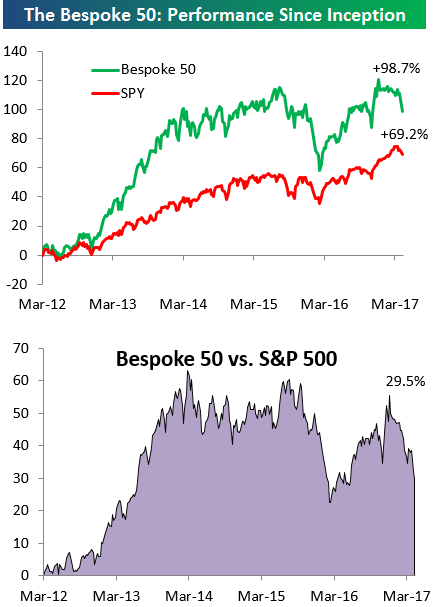 Since inception in early 2012, the “Bespoke 50” has beaten the S&P 500 by 30 percentage points. Through today, the “Bespoke 50” is up 98.7% since inception versus the S&P 500’s gain of 69.2%. Always remember, though, that past performance is no guarantee of future returns. To view our “Bespoke 50” list of top growth stocks, sign up for Bespoke Premium ($99/month) at this checkout page and get your first month free. This is a great deal!